My husband has attended, or taught training for work, several times in Orangeville, Ontario. We always look forward to these weeks away, as it's a change from our normal routine and we can almost pretend we are on holiday. I escape the majority of the usual daily chores from home, we eat pancakes every morning, and we have the added bonus of swimming in the in-house pool every day (the highlight for our boys). Generally things are fairly easy breezy. Where things tend to go sour is in the daily routine. I mean, our younger son's daily routine of sleeping. Now, I know that in life there are always times when routine's need to be altered. Our older son has always been fairly flexible in that way. Our younger son, on the other hand, goes absolutely bananas should his routine go off in the slightest. And even when the bed is there, the bed is cozy, the time is right, and the milk is warm, something can throw the whole darn thing off. How do you get a little one to nap, when he has recently learned that a playpen cannot contain him? How do you have a little one sleep when he has invisible toothpicks prying his exhausted eyes open? How, please tell me, HOW do you encourage relaxation in a room that is as bright as the sun outside it's window?? And lastly, how do you maintain quiet in said room when you have a 3 year old non-napper who has no where else to go? I believe what works with travel changes completely everytime. One thing under two's are not, is consistent. We have discovered a few tricks along the way, but then they don't always work. This afternoon, napping was, well, just not going to happen. I placed our usual binder clip stash down the middle of the two curtains to lessen the outside light. I tried using the luggage rack, a couple of hiking shoes, and an ironing board in countless configurations to hold the curtain closer to the wall, and yet still the light beamed through that window. Our general routine finds my older son and I passing the time in the hallway colouring, reading books, kicking a ball, snacking, or watching cartoons on the laptop. We keep the hotel room door slightly propped by the lock (about an inch) so I can hear the little guy if he wakes. 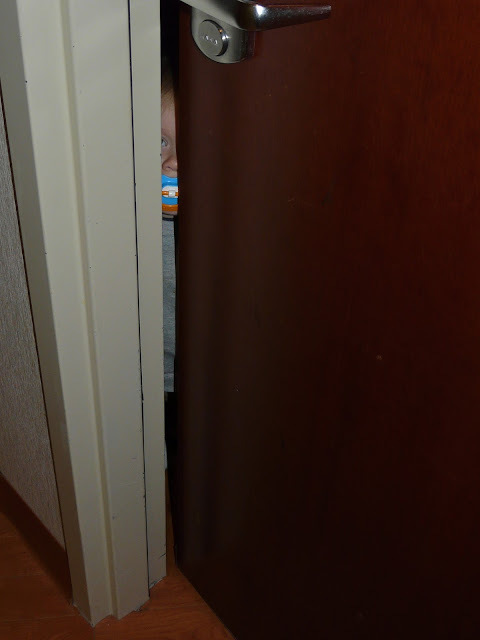 Today's hallway fun included the exciting afternoon game of - put Owen in the playpen, sit down in the hallway, wait 3 minutes, hear little sounds at the door, see the little man peeking at me through the crack in the door, go in the room and put him back in bed. This went for a few rounds. At one point, I thought I heard a noise, peeked through the crack in the door, and instead of coming to the door, there he was sitting. In the dark. On the couch. Oh boy. Well, I couldn't keep this game up all day. 30 seconds after that, there he was tearing up and down the hallway, laughing his head off, chasing and kicking a ball with big brother. You totally won today little dude. But... Tomorrow we will play again. I love being a mom but nap time is the business. Sadly, Hudson doesn't nap anymore. Must be tough on you having two and a little one on the way. Crossing fingers and toes that they both decide to pass out and let mommy sleep!